Self-stick tile floors offer a quick and often inexpensive method of tile installation compared to tradition adhesive and tile options. With the adhesive already placed onto the tiles, you simply pull away the paper backing and stick the tile into place, closely butted together to give you the look and feel of traditional tiles. Unfortunately, such installations are not waterproof, with the joints between the tile and the lack of adhesive covering the entire subfloor offering plenty of opportunities for water seepage. However, with a bit of extra labor you can waterproof a self-stick tile floor; all it takes is filling in the joints and sealing the tile surfaces. Waterproof your self-stick tile by adding grout and caulk to the joints before sealing the entire surface. 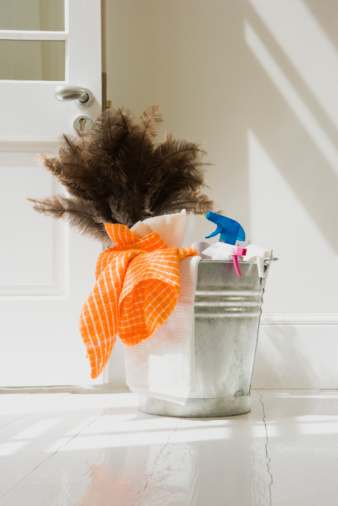 Remove all dirt from the tile using a broom to sweep away loose dirt, and then mop the surface with a rope mop and pH-neutral floor cleanser. Rinse the cleanser away with clean water. Allow the floor to dry for two hours. Fill the joints between the tiles with grout pushed into place with the edge of a grout float. Spread the grout with the edge of the float over the tile surface into the joints until the grout in the joints is level with the tile surface. 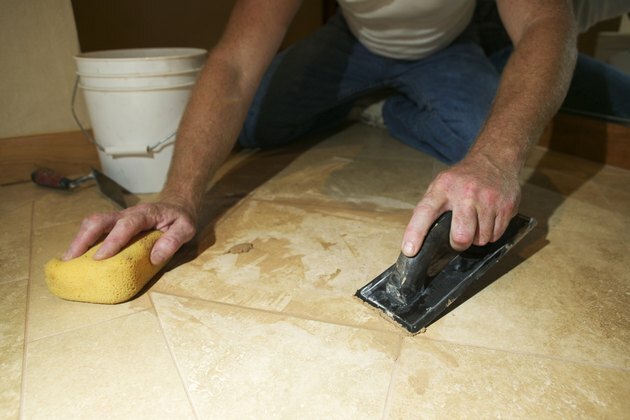 Wipe away the excess grout on the tile tops with a damp sponge after spreading the grout. Wait two hours and then wipe the tiles off with a lint-free cloth to rid the surface of any residual grout. Fill the joints at the edge of the tile surface and the walls or adjacent surfaces with silicone caulking. Pump the caulk into the joints until the caulk is level with the tile surface. Wipe the caulk level with a wet fingertip. Allow the grout and caulk one-week drying time. Brush the surface of the tile and grout with a tile and grout sealer to increase the waterproofing. Cover the entire surface with the sealer, working in overlapping rows across the floor. Let the sealer dry for an additional 24 hours before stepping on the floor.